The new year started off on a positive note for Canagasabapathy Viswalingam Wigneswaran! The Northern province chief minister was invited by Sri Lankan President Mahinda Rajapaksa for a discussion on January 2nd.A direct meeting with the Executive President was something the former Supreme court Judge had been trying to secure for a long time during the last quarter of 2013.Now with the dawn of 2014 the much awaited appointment had become a reality. CV Wigneswaran accompanied by Tamil National Alliance(TNA)national list MP and lawyer MA Sumanthiran met with the President at 12.30 pm on Thursday January 2nd. Secretary to the President Lalith Weeratunga,Cabinet secretary Sumith Abeysinghe and Treasury secretary Dr.PB Jayasundara also participated in the discussions held at “Temple Trees”. The primary purpose of the meeting was to discuss ways and means of resolving the Northern imbroglio. As stated in these columns earlier “Sri Lanka’s Northern Provincial Council is presently entangled in an intricate imbroglio. 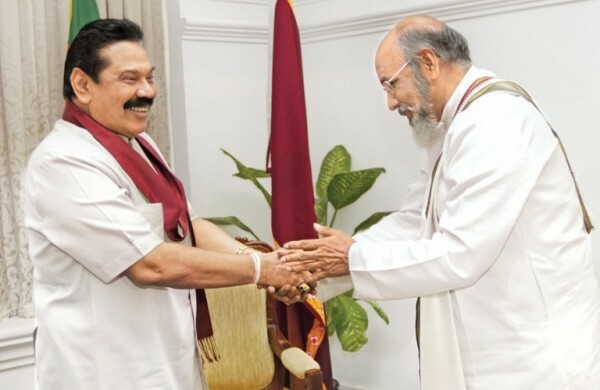 The newly elected chief minister CV Wigneswaran of the Tamil National Alliance (TNA) is at loggerheads with G. A. Chandrasiri the Governor appointed for the Province by President Mahinda Rajapaksa. This titanic clash between the former Supreme Court Judge and the retired Army Major-General has virtually paralysed the Northern Provincial Council besides raising Constitutional issues of a controversial nature’’. Various issues and problems were thrashed out at the meeting cordially conducted meeting.As is customary President Rajapaksa lent a receptive ear to Wigneswaran’s woes.The chief minister raised several matters described as ‘’impediments to the effective functioning of the Northern Provincial Council’’.Among these were issues such as “the appointment of key officials, the provision of required finances and enabling the Provincial Council to exercise the powers currently devolved under the Constitution and moving beyond to make devolution meaningful”. It was emphasised at the meeting that immediate action was required on a number of pending issues pertaining to the smooth functioning of the Northern Provincial Council.This was imperative for the council to address the needs of the war affected people of the North particularly issues relating to the war widows, the displaced, the dispossessed, the war orphans, the long term PTA detainees, women headed households and other vulnerable sections of Northern society. It is reliably learnt that some constructive decisions were arrived at and also some positive assurances made at the meeting.It remains to be seen as to how these decisions are implemented and pledges fulfilled in the near future.Enlightened sections within both the Government as well as the TNA recognize that the efficient functioning of the Northern Province council under a democratically elected chief minister is beneficial to the Country in general and the Tamil people in particular.It is hoped therefore that perceived bottlenecks are swiftly eradicated and the Northern administration begins to discharge its duties effectively and speedily. Given the current political situation this task is certainly a formidable one.It requires a joint effort by the Government and TNA for this to happen satisfactorily. For this a cooperative and not a confrontational relationship must prevail between the Colombo Government and Northern administration.The need of the hour is to prevent the functioning of the Provincial council getting enmeshed in Govt-TNA politics.Since the TNA is controlling the council evolving a distinct cooperative approach by a TNA dominated Council and separating it from the confrontational politics of the party would be a massive challenge. Such a separation of roles may appear to be somewhat complicated but it is possible and necessary.One may take the moral high ground and argue that it is the sacred duty of the government in power to enable a provincial council to function well even if controlled by an opposition party but it is simply impossible in practical politics. That is the nature of things political. This is by no means an ideal situation. Nevertheless it is indeed the prevalent reality. This practical reality has been understood and even accepted by the voters of this country. It is a fact of existing politics that people voting at local authorities and provincial councils tend to support candidates from the ruling regime. There are exceptions of course but this tendency of supporting the party in power as the government in local government polls has crept into the body politic.Unhealthy it may be from one perspective, but from that of the voter who engages in this practice it is nothing but practical or even pragmatic.This is because the average voter is alive to practical realities and does what he or she can do in a democracy that would better their life.They know that voting for an opposition party in local elections may not be in their best interests. This does not mean that people do not vote for opposition parties.They do. What is important here is to recognize the tendency to support the party in power at local polls because of the expectation that greater advantages could be gained by such practice.It is understood that a local administration favoured by the Government has more opportunities to reap more benefits. If on the other hand an opposition party is elected to head a local administration and adopts a confrontational course with the Government in power its days may be numbered or it would find itself crippled or circumscribed and rendered ineffective.Thus if any local authority or council wants to do the best it can for the people who elected it then it has to come to terms with some form of political cohabitation.It is only a spirit of compromise and cooperation that will help it produce constructive results. A confrontational course could be disastrous and leave those who supported it very vulnerable and frustrated. It is pertinent in this context to look at the role currently played by Colombo’s UNP Mayor AJM Muzammil.Instead of adopting a confrontational course against the Government he has cultivated a working relationship with Defence and Urban development secretary Gotabhaya Rajapaksa and despite hostility within his party is engaged in a constructive partnership to improve and develop Colombo.The UNP mayor often acts independently to that of the line followed by his party.Last November Muzammil attended the CHOGM summit opening whereas the UNP boycotted it as a party.As was to be expected Muzammil’s approach angered many in his party.Recently newspapers reported an incident where the Colombo mayor reportedly lashed out at his critics. According to a news report in “The Island” – “an irate Muzammil lambasted those who had been accusing him of being ‘Gota’s man.’ Claiming that the city had achieved much during his tenure as the Mayor, Muzammil alleged that a section within the party was reluctant to appreciate the developments taking place”. Notwithstanding criticism within and outside the party the UNP mayor of Colombo has embarked on a mission to do his duty by the ratepayers of Colombo who elected himMuzammil is adopting a cooperative approach towards the UPFA Government regardless of inter –party politics. It is this kind of approach in essence that the TNA dominated Northern province council and its elected chief minister must think of adapting and adopting towards the UPFA led government of President Mahinda Rajapaksa in the current context. Apart from being controlled by an opposition party the Northern province situation is more problematic in terms of centre-province relations due to other factors.The ethnic composition of the province is predominantly Tamil and the council is controlled by a Tamil party.Historically the Tamil demand to share power at the periphery has been resisted by the Sinhala majority. In recent times this conflict sharpened to that of a secessionist armed struggle that was crushed militarily. Against that backdrop the demand for greater devolution is likely to be viewed suspiciously. Reinforcing these doubts is the perceived relationship of the TNA with the Liberation Tigers of Tamil Eelam(LTTE)that spearheaded the military campaign for a separate state.Though the tigers were defeated militarily , TNA politicians continue to fuel suspicion by engaging in provocative “tigerish” rhetoric. Some also maintain links with LTTE and pro-LTTE elements in the Global Tamil Diaspora.In such a situation suspicion and hostility will prevail in Colombo and even the most innocuous request or action is likely to be perceived as sinister or diabolical. It must also be remembered that the TNA engaged in pro-LTTE rhetoric during its recent provincial poll campaign.Wigneswaran himself shocked and disappointed many by indulging in such talk.After hearing several cases under the Prevention of Terrorism Act(PTA) and imposing sentences when serving as a Judge, the Sitar playing Wigneswaran strummed a different melody by saying the tigers were freedom fighters and not terrorists.He also called LTTE leader Prabhakaran a great hero. The TNA has also contributed to and even aggravated the current confrontation with Northern Governor General(retd)GA Chandrasiri.The TNA notably Wigneswaran made an issue out of it on political platforms during the provincial election campaign.Instead of handling the matter deftly and adroitly by resorting to quiet diplomacy the TNA indulged in confrontational sabre rattling against Chandrasiri describing him unfairly as “military governor”.Now the TNA finds it has no sword in its sheath or scabbard. Under these circumstances the TNA in general and Wigneswaran in particular would do best by altering their confrontational course. The long sought meeting with the President could be the prelude to either a new cooperative relationship or an uneasy calm before a destructive political storm. The onus however is on Wigneswaran to personally initiate a fresh , positive,pragmatic approach that could remedy and rectify matters.If that happens the meeting with Mahinda could prove a harbinger of hope for the Northern provincial council. Evolving a new approach requires a de-linking of “Udanadi pirachinaigal” (Immediate issues)from “Adippadai pirachinaigal”(fundamental issues). 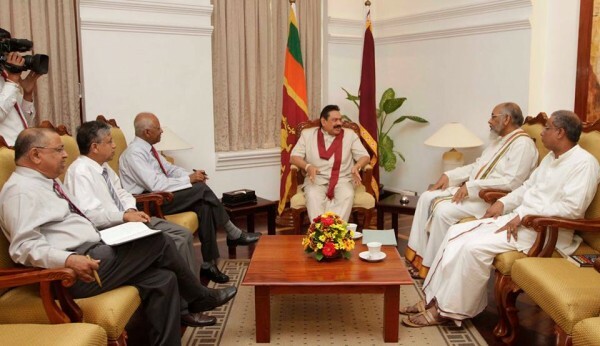 In the meeting with President Rajapaksa ,Wigneswaran and Sumanthiran raised a number of issues. The pitch was on the basis that urgent action was required to alleviate problems faced by the war affected society particularly the weaker and vulnerable sections. This is a stance that would be most welcome but then the TNA mixes up a number of demands together while emphasising priority for immediate issues. The mixing of issues is likely to cause confusion and problems. The search for greater devolution for instance is a protracted exercise needing time. It is also President Rajapaksa’s position that the TNA should participate in the Parliamentary Select Committee proceedings and support its greater devolution cause there.The TNA resists this overture and in a meeting held in Vavuniya on Christmas eve Parliamentarians and Provincial councillors of the alliance decided that the party will not accept the invitation. In this deadlocked state, lumping the immediate problems of a humanitarian facing the provincial council with the goal of greater devolution and other political problems would result in further impasse. So if the problems needing urgent action are to be addressed the TNA must demarcate them into twin categories of “immediate” and “fundamental”. Thereafter it must find ways and means of addressing the immediate issues speedily and effectively. These are basically humanitarian problems where time is of the essence in redressing them. The Northern people who voted for the TNA and cast their preferences for Wigneswaran expect their provincial council and chief minister to try and fulfil their expectations.They do not want imbroglios with the Governor and delays in Constitutional negotiations to obstruct their needs being addressed. It is the duty and responsibility of chief minister Wigneswaran to appreciate this and act accordingly. For this, it is necessary for Wigneswaran to swallow his pride and enter into a period of non-confrontational cohabitation with Governor Chandrasiri.There is no doubt that Chandrasiri will have to quit at some point of time. This is inevitable but it is for Wigneswaran to realise that such a departure is being delayed only by the confrontational attitude displayed by the chief minister and council.Thus it is best that Wigneswaran forge a working relationship with Chandrasiri. If that is possible then transfers and replacements of problematic senior provincial officials is quite possible. Another possibility in this respect is for Wigneswaran to request President Rajapaksa to convene a meeting with both the Governor and chief minister. It would be good to discuss all problems and issues concerning the Governor and chief minister candidly with the President himself. A better understanding may be possible in such circumstances. More importantly the Northern chief minister should act decisively and establish closer rapport with President Rajapaksa.This rapport is very essential for an opposition party chief minister of a province that is predominantly Tamil in a Country where the majority is Sinhala. Also the reality today is that the executive president is all powerful and maximum devolution is possible only at his discretion. It must also be realised that in the present situation there is a need for President Rajapaksa also to ensure that the Northern council functions well.Thus if Wigneswaran strives towards a closer understanding Mahinda too is likely to respond positively. Evolving such a relationship can be impeded if Wigneswaran allows the Provincial Council issue to be embroiled in the political cold war between the TNA hierarchy and the Government.Matters concerning the provincial council should be de-linked from the politics of the TNA.It is pragmatic for Wigneswaran to disassociate from the overall politics of the TNA and devote himself to matters concerning the council alone.The effort should be to de-politicise provincial issues as far as possible and technocratize them to possible extent. The Northern province chief minister would do best at this critical juncture to restrict himself to regional issues only and desist from the temptation to play a national role. It is for TNA leader Sampanthan and other Parliamentarians to use Parliament and other fora to highlight problems related to the Tamil national question. Wigneswaran should confine himself to provincial council matters. Today his biggest challenge is to remove bottlenecks and get the Provincial council work effectively.The chief minister should focus on this formidable task with single minded devotion and not fritter away his energies to issues unrelated to the council.He should refrain from commenting publicly on issues outside the purview of a provincial chief minister. If Wigneswaran is able to do so he must try and meet the President as many times as possible in the coming weeks and discuss matters frankly and forthrightly.This is very necessary at this time because this is the phase where much spadework is needed to ensure the working of the council. It would also be better if Wigneswaran gradually frees himself from the control exerted by TNA parliamentarians. The chief minister should meet the President and other ministers and officials on matters regarding the provincial council without TNA parliamentarians tagging along. He should include senior provincial officials and advisers in delegations led by him at such meetings if and when necessary.It would also be good if a division of labour is brought about in the TNA where Parliamentarians reduce references to Provincial council issues while speaking in Parliament.Likewise Wigneswaran and other provincial councillors must not speak about larger political issues unrelated to the provincial council during council sessions. Chief minister Wigneswaran must surely be aware that destiny has chosen him to play a significant role in Sri Lanka at this point of time.This role primarily is that of working for the betterment of the Northern province people through the provincial council mechanism. It would be an exercise in futility for the chief minister to confront the President and Government on prickly issues and arouse ill-will and hostility. It would be advisable to avoid such issues and instead focus on matters where concrete action is immediately possible. The priority should be on formulating short,medium and long term projects that would address immediate problems and also pave the way for future prosperity.For this the pragmatic path of cooperation and not confrontation with Colombo must be followed. It is also necessary for Wigneswaran to act with prudent restraint and dignified decorum befitting a former Supreme court judge and not be involved in cheap politicking amounting to tomfoolery.Events like the Valigaman high security zone (HSZ)fiasco should be averted. When Wigneswaran was informed that schools and temples were being demolished in the HSZ he rushed to the area and tried to enter. To his discomfiture he was refused entry and forced to turn back.Later he reportedly told Mano Ganesan of the DPF that he would have considered it a blessing to have died in the HSZ. The entire act smacks of playing to the gallery politics.In keeping with propriety the chief minister should have either informed the military commander of the North or the DIG of Police that he wished to inspect the area in an official capacity. There was every chance that the request would have been adhered to as a matter of courtesy. If refused the matter could have been taken up at a higher level.Instead of doing that Wigneswaran simply rushes to the spot and engages in theatrics.In any case he would not have been physically harmed.So for him to say he was prepared to die is downright laughable. If the Northern chief minister is to evolve a pragmatic,cooperative relationship with the President and enable the provincial council to work for the betterment of the people , it is necessary for the provincial council issues to be de-linked from overall TNA politics.Also the chief minster should concentrate on provincial council issues alone and not get involved with other matters. Wigneswaran attempting to de-link from party diktat and forge a separate relationship with the President in order to be of yeoman service to the Northern people who elected him will naturally be resented by hardliners in the TNA and the tigerish elements in the Diaspora.Wigneswaran however will find support from the silent majority of Tamils as well as progressive elements in the south who have a genuine interest in the welfare of their northern brethren.The challenge is certainly daunting but it is time for the chief minister to demonsrate that he is a man of the people and not a puppet of irresponsible hawks in his party.